Not every wedding has to follow the same old pattern. If you want your big day to be that little bit different, take a look at these marriage customs from around the world. Adapt one or two of them to your own wedding and you'll have an occasion everyone will be talking about. 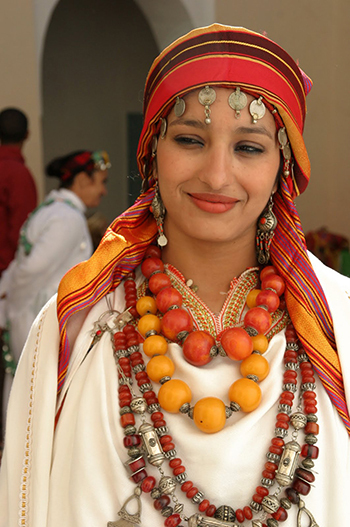 Moroccan brides start their wedding day by having a ceremonial purification milk bath before having their hands and feet intricately painted with henna. In Estonia, the classic tradition of whichever woman catches the bride's bouquet being the next one to marry is adapted for men. The groom is blindfolded, then spun round. The single man whose head he puts his top hat on will be the next to get hitched. Italians cut up the groom's tie, then sell the pieces to help fund their honeymoon. An Anglo-Saxon groom would tap the heel of his bride's shoe to symbolise his authority over her. Latvian brides are "kidnapped", and the groom has to pay a ransom (a song or a round of drinks) to get her back. At Finnish weddings, the groom's mother balances a china plate on top of her head when the newly-weds begin their first dance. The number of pieces it breaks into when it falls predicts how many children the couple will have. In a Russian Orthodox wedding, the bride and groom race each other to the carpet they stand on to make their vows. Whoever wins will be head of the household. Before a Swedish wedding, the bride's mother gives her a gold coin to place in her right shoe, while her father gives her a silver coin for her left shoe. This symbolises a wealthy future. 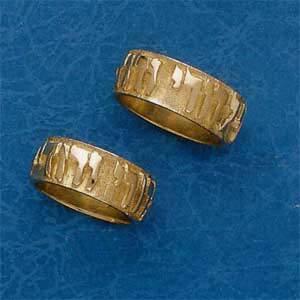 Another Jewish tradition is that the wedding ring should be completely plain, with no jewels or markings. This symbolises eternal love - there's nothing to mark the beginning from the end. German couples hang objects on a "bride's tree". A teapot, for instance, represents hospitality. In Mexico guests form a heart shape around the couple as they have their first dance. 'Confetti' has the same root as the Italian word for 'confectionery' - in pagan times the married couple would be showered with grain and nuts coated in sugar. In Britain it's lucky for a chimney sweep to come to the wedding and kiss the bride. The tradition stems from when King George III reigned. The King's horses ran out of control and a chimney sweep stepped in to save him. The King proclaimed, by Royal Decree, all sweeps were good luck bearers and should be treated with respect. Chimney sweeps are also linked with early pagan wedding rituals where the black colour symbolises fertility. Part of a traditional Sudanese wedding involves the Maid of Honour burning seven broomsticks to symbolise the discarding of bad habits before starting married life. Finally, at Venezuelan weddings, it's traditional for the newly-weds to sneak away from their reception without saying goodbye to anyone. This is thought to bring them good luck.